The Raccoon River Valley area will continue to see precipitation throughout this week. 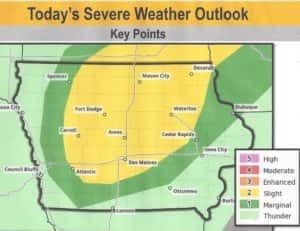 According to the National Weather Service, Greene, Dallas and Guthrie counties are under a slight risk for severe weather for today. 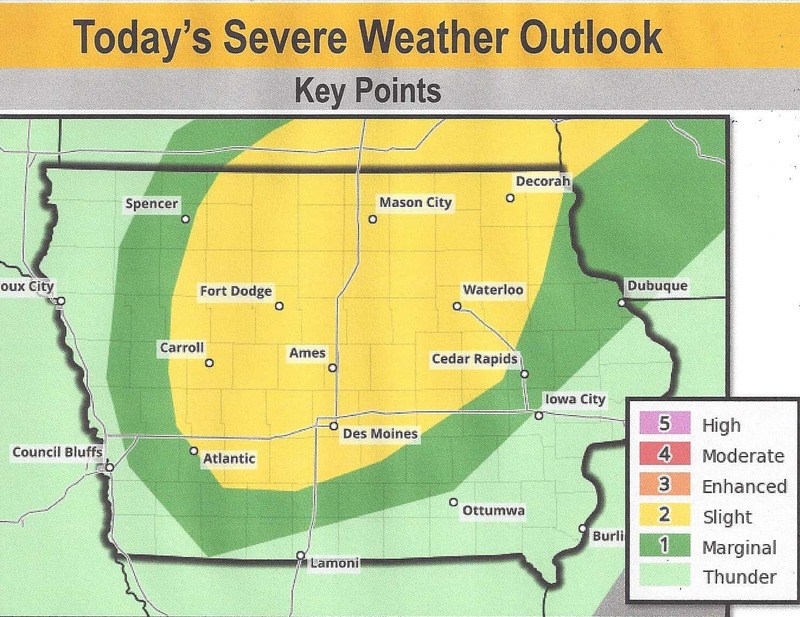 Potential threats with severe weather risks include damaging high winds, hail and heavy rainfall. The National Weather Service is estimating between one and two inches of additional rainfall through Wednesday morning. Dallas County is also under a Flash Flood Watch until Wednesday morning. Some of our listening areas have seen quite a bit of precipitation already this past weekend. Since August 31st, Guthrie Center has seen two-inches of rainfall, while Perry reports 1.14-inches of precipitation. There was no information available for Jefferson. Anytime there’s severe weather in Greene, Dallas and Guthrie counties, Raccoon Valley Radio’s Severe Weather Action Team provides live coverage of each severe weather incident. We give road condition updates, as well as cancellation and postponement information. The one to count on for severe weather coverage is the Raccoon Valley Radio Network.